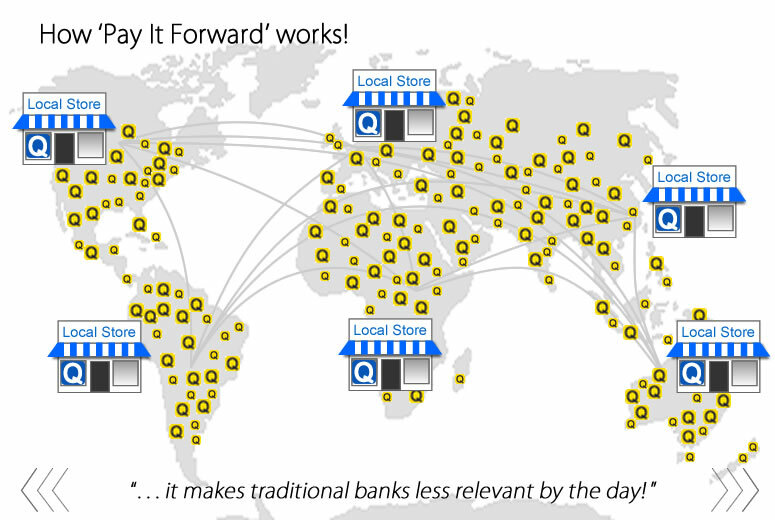 Pay It Forward's action validates a seller's commercial activity between Offline to Online ( O2O ), making the local seller's 'brick and mortar' store the new Place Of Trust in local commerce! - the buyer is in fact paying for another buyer's purchase in the everyday commercial sales activities of the seller! The two customers are anonymously linked globally to each other and that allows something unique to happen! The 'buy' digitalizes the cash and makes it ubiquitous to use within the dynamics of global commerce, for free! It also means that the action is not limited within a country, it can spread to benefit local economies in other locations around the world in the most transparent yet secure way possible, without leaving the environment of global commerce! - this activity and many other types like sellers needing to pay suppliers can all be done without exchanging fiat currencies or involving the usual incumbents and costs. Pay It Forward removes the need to split the payment process between a buyer and a seller, which normally takes money from the buyer and moves it out to a bank or payment service and then back in to a seller. Pay It Forward keeps the buyer and the seller inside the commerce environment and invites another buyer to complete the commercial activity as part of the normal activity for a seller. Banks were originally created to store money on behalf of people, now in the digital era the need to store physical cash is being disrupted and replaced by the digital cash ecosystem that will become the new storage platform. What the Platform does is disrupts the way supply and demand operates in commerce, the DNA in commerce is changed to highly incentivize the supply to increase demand in an uninterrupted flow between buyers and sellers! Instead the Platform changes it so sellers sell high and buyers buy low, and it doesn't cost money or jobs to do it! - it can even provide those sellers who don't feel like helping their economy with deep discounts, there are Flex-Deals. There's no rule in commerce that says the seller can't divorce the buyer so that both can benefit!
" . . . where does the money go with discounting anyway?" The Platform disrupts commerce by targeting inequality in all economies, it gives tools to all players to rebuild commerce for this Digital Era using Fractional Economics to drive Productivity forward in real time and help to solve the past! - this is Cloud Commerce on a global scale!